Get your racquet out of the loft and dust the cobwebs off your balls, Actua Tennis has hit town. Tennis games have yet to really catch on, the only memorable one so far has been Match Point back in the days of the Spectrum. Over the past month we have seen Game, Net and Match, now we have Gremlin's latest addition to the Actua Sports series, Actua Tennis. You are likely to know all about the other Actua Sports series games. Actua Soccer, Actua Golf and Actua Ice Hockey, these games always seem to come up against stiff opposition in the form of EA Sports. This time around though the only real competition they have is Game, Net and Match, not exactly much to beat in my opinion. So what does Actua Tennis add to the PC sports gaming genre? We have the usual bulk of options, 3D graphics and multiple views...here is a run down of the main features in the game. Quick Match - This option lets you get straight into a match without needing to change any of the game settings. The match can be played either against the computer, or against a friend. You are placed at a random stadium each time you play. Single Match - Lets you play against the computer or a human opponent. This time you get a number of different options compared to the Quick Match style...you can choose Men's Singles, Women's Single's, Men or Women's Doubles or Mixed doubles. You can also change the ground in which you are playing on. Network Match - You can set-up a full network match against up to 4 players. IPX, TCP/IP, Modem and Serial connections are all supported. New World Tour - The New World Tour option is the largest, and probably the best of all the options...you get to play all the main tournaments that are played across the world. I first tried my hand at a quick start game. The first environment I got placed on was a clay court. I played the first game on the Sidewinder Precision Pro joystick (It's easier to control on a joypad). Movement of the players is very fast, this sometimes makes you run past the ball that is flying towards you at 100+ MPH and miss the return shot. Once you play for about an hour or so, the movement, speed and skills of the controls start to come naturally to you. You have two buttons to get used to on your Joystick/Joypad/Keyboard, they are the Shot and Lob buttons...pressing the shot button twice, fast, allows you to do a "Super Shot", you tend to be allowed to only use four of these shots during a match. This option can be turned off, as the speed in which the Super Shot comes at your opposing player is far from realistic. Serving is done by a "Serve Meter", this allows you to judge the speed and accuracy of your serve. It's pretty basic stuff, but it all works well to help you get playing fast. The action is usually fast paced, as it is with most Actua Series games. Once you learn the controls, it tends to be easy to return shots and run about the court at high speeds, diving around trying to stop yourself losing points. Single player mode is great, building up your own player to become one of the top players in the Actua Tennis game give you a good feeling. All the proper player names are used in the game, so you get to play against Sampras, Rusedski, Henman or even tussle with Anna Kournikova, which I'm sure will be a favourite with a lot of people. Each of the "Real Life" tennis players seems to have the correct abilities, Sampras for example has an excellent service, as does Rusedski. The higher they are ranked, the better they are - and as a new player, you do tend to start right at the bottom of the rankings table. Doubles games are played at a frantic pace, especially when playing against a friend. You both play on different teams, the other member of your team being the computer controlled player. The AI seems spot on during the Doubles games, and the computer controlled player hardly ever gets in your way, or takes shots that should clearly be taken by you. Actua Tennis comes with native 3Dfx and Power VR, it also has full Direct 3D support, so almost all 3D cards are catered for. I selected the 3Dfx version and ran the game in 800x600 mode. 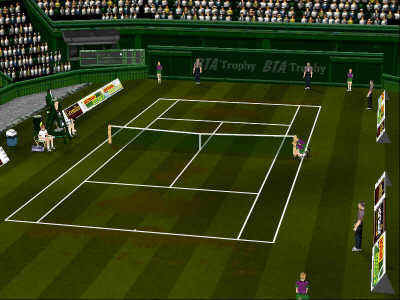 The animation on all of the players, umpires, line judges and ball boys is superb, as expected on a motion captured game, the crowd, while looking better than in a lot of other sports games, does let the game down a bit. There are 3D options for Ball Trails, Sky Settings, Shadows, Ball Size, Racquet and Net Transparency. The players shorts, shirts and almost everything else on them can be changed manually to suit your style, you can add Caps or even sunglasses to players, this all adds to the atmosphere of the game. The courts all have their own look and feel, so thankfully it doesn't seem as if you are continually playing in the same court over and over again. Now here is the bad part, and this has nothing to do with the graphics. I felt that the in-game sound was poor. The commentary, despite being well read by Pat Cash, Sue Barker and Barry Davies, is so repetitive during the games, you just tend to switch it off...this is something I have never done in another sports game I always play, Fifa: World Cup 98. I am sure they could have added more speech to the game, Actua Soccer 2 is another good example of well used commentary. The crowd cheers are also poor, and there is very little variety in any of the cheering. Far better than Game, Set and Match. It's addictive and fun, just as a tennis game should be. Creating your own tennis player is another good feature, and playing against a friend either via a modem or just with another joystick is great. So what would I like to see in Actua Tennis 2? More tournaments and a good running commentary for a start. All rights reserved. More copyright information and legal stuff here. ActiveWindows is a division of Dark-Design.